Our last day of a four day "weekend". JoAnn and I hit the waters off of Edmonds in search of more coho. Conditions: partly cloudy, 60s, winds out of the south 10mph, LT at 11am. 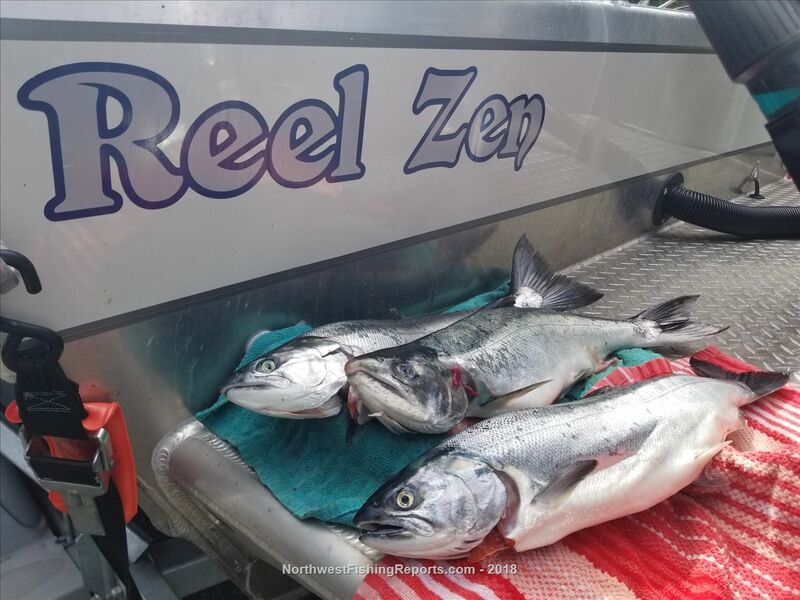 The first fish of the day came quickly at 7:20am, and it was caught using Rule #4 of my recent Ten Rules of Coho Trolling article - let the gear drift up to the surface when you pop your gear off the clip to check it. In this case, the coho slammed the lure just as the flasher popped on to the surface, pretty cool! First fish in a 5 pound clipped coho. The action was quiet down by the oil docks, saw one or two caught but not many on the fish finder so I decided to move us out and north of the ferry crossing, putting us firmly in Area 9. I had been avoiding this as I didn't want to play catch and release but it payed off as we quickly hit a fish at 8am, and again at 8:07. 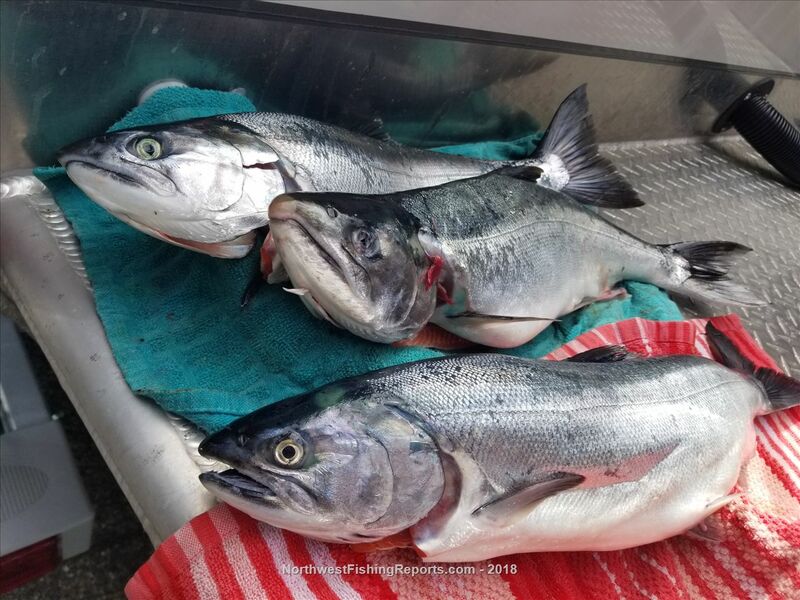 Two more cookie cutter 5-6 pound clipped coho, all caught on the same army truck/gold medium hoochie, a herring strip, and set at 45 feet deep on the down rigger. We ran 3 to 4.3 mph, catching each of the last two fish in opposite directions. After pounding this area another 45 minutes the wind started to pick up so I set us on a north course to surf the wind and try to get into the lee north of Edmonds. No fish, but WDFW did pull up next to us. After a friendly check of gear and fish they let us know we were doing good compared to most anglers, which always helps one's ego. Since the gear was up I decided to run us over to Possession Bar and see if it was fish-able. It was, and let me tell you, the south east side of the bar and all along the east side is full of fish and bait! Thinking we would pound out our last fish in no time, we actually took about 45 minutes before the same army truck hoochie rod hit fish number four. The best of the day, I reeled him to the boat only to find a fin in place. Safely released, we fished a little while longer down to the green can and decided to call it a day as those winds continued to pick up. The Thunderjet handled the return trip into the wind pretty good, next upgrade may be those fancy hydraulic seats! I can't thank JoAnn enough for going out with me four days in a row, what a nice string of fishing we had! I'll be hitting the Sound for the next three weekends. Say "hi" if you see me out there. Good luck! Great report Mike! 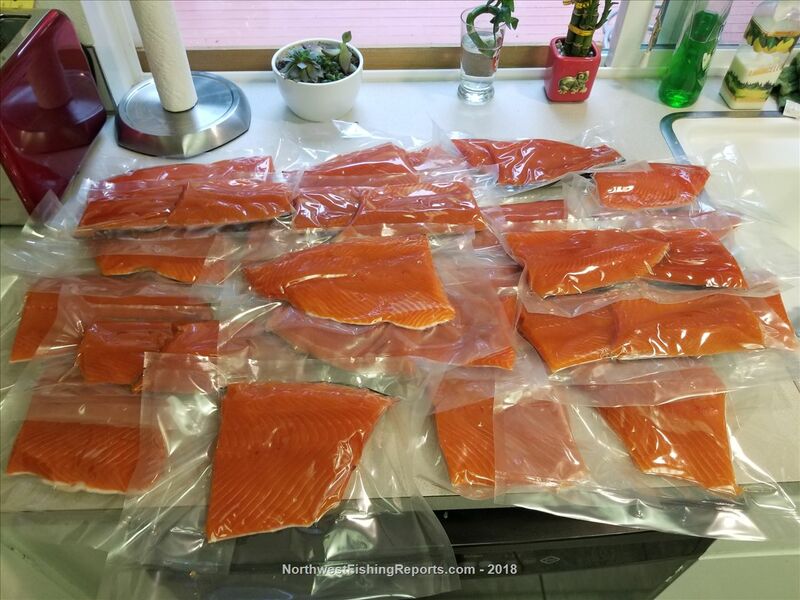 Sure looks like you and JoAnn have those "Lake Puget" Coho figured out. 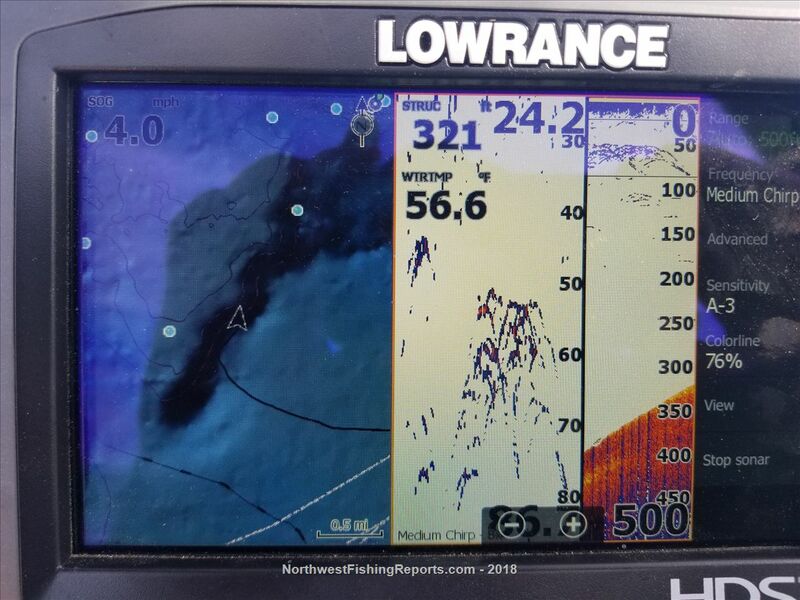 Hi Mike, I was wondering how much angle your transducer beam covers on your fish finder? to be honest, I'm not sure. I have it on "medium chirp". I believe I had it set for a wider beam, not narrow.